3 Bedroom Terraced House For Sale in Sale for Guide Price £270,000. 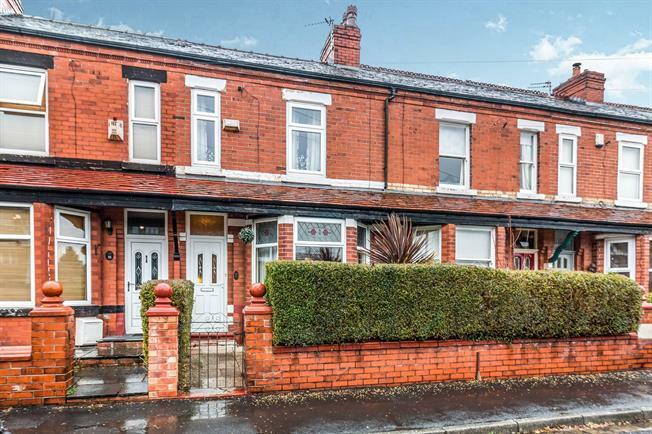 GUIDE PRICE 270,000 - 280,000 This three bedroom period mid terrace property is presented beautifully throughout and can be fully appreciated upon viewing which is highly recommended. Briefly comprising; entrance hall, lounge, dining room and spacious kitchen to the ground floor. Three double bedrooms and a family bathroom to the first floor. The property also benefits from a rear garden. Enter the property through the UPVC front door which leads from the front garden. The hallway is warmed by a radiator and has stairs rising to the first floor landing as well as access to the dining room. A well presented room with a log effect electric fire being the focal point. The room is bright and spacious with a double glazed uPVC bay window facing the front with partial stain glass. There is a radiator, carpeted flooring and a ceiling light. Wooden French style single glazed doors open from the lounge into the dining room creating an open plan feel. There is a double glazed uPVC window facing the rear overlooking the garden, a radiator, carpeted flooring and a ceiling light. Fitted with a range of built-in wall and base units, the kitchen has a stainless steel sink and with mixer tap over and drainer, an integrated electric oven and an integrated electric hob over with a hob extractor over. There is also an integrated dishwasher, space for a washing machine, and space for a dryer. The room is light and spacious with uPVC double glazed windows facing the side and the rear. There is a UPVC side door opening onto the garden, a radiator, vinyl flooring and a ceiling light. A double bedroom with two double glazed uPVC windows facing the front. The room is warmed by a radiator, has carpeted flooring and a ceiling light. There are built-in wardrobes allowing plenty of storage space. Another double bedroom with a double glazed uPVC window facing the rear overlooking the garden. The room has a radiator, carpeted flooring and a ceiling light. The third bedroom has a double glazed uPVC window facing the rear overlooking the garden, a radiator, carpeted flooring and a ceiling light. The carpeted landing has access to all three bedrooms and to the family bathroom. A three piece white suite comprising; low level WC, panelled bath with mixer tap and shower over and a pedestal sink with mixer tap over. There is a double glazed uPVC window with frosted glass facing the side and a heated towel rail.